Today I have the pleasure of welcoming the lovely L.A. Weatherly, author of the bestselling Angel series, to chat about her new trilogy, Broken Sky. 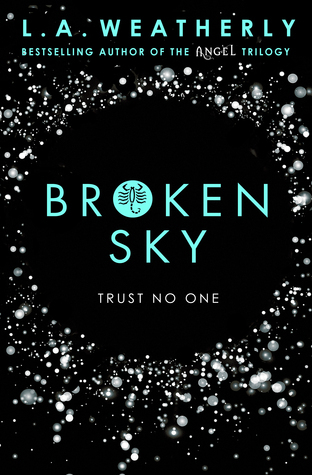 For fans of Disruption and Divergent, Broken Sky welcomes readers to a new ‘utopian’ world where war is illegal and the date of your birth marks your destiny. Set in a distorted echo of 1940s America, the trilogy is full of deception, heartbreak and rebellion. And it follows a young pilot (how cool is that?!) called Amity who is battling to maintain peace in a world full of double agents, suspicions, and betrayal. 1. What would you define as the ‘perfect’ world? For me personally, it’s a world where champagne and dark chocolate truffles appear by a snap of my fingers, preferably while I lounge on my private beach in the Caribbean. For my characters…well, definitely not the world they’re living in! 2. Broken Sky is very different to your bestselling Angel series. What gave you the inspiration to write this new series? You know, I actually have no idea. Usually with my books I can point to what sparked the concept – with the Angel series, it was seeing a non-fiction display of books about angels. With Broken Sky, I was having dinner with my husband in our favourite Thai restaurant, and the idea literally just popped into my head: what if there was a world where conflicts between nations were resolved by two fighter pilots going up against each other in Spitfires (which became Firedoves in the story)? 3. How did you go about picking the name ‘Amity’ for the main character? Did she have a different name that evolved as you made changes to the first draft? Great question, and yes, she did. Amity was originally called ‘Danni’, but I somehow couldn’t make the character come to life with that name. It just didn’t feel right. Then I started thinking about the world – this society based on the ideal that war is the ultimate evil – and realised that a name that was a synonym for ‘peace’ would work far better. When I came across ‘Amity’, I knew it was perfect (and she started talking to me then!). And you didn’t ask, but here’s a bonus answer: Collie had a different name to start with, too. He was Chase. In fact, several of my main characters pretty much demanded new names all at the same time. It was a frustrating few weeks (renaming characters is HARD), but I think I found the perfect names in the end! 4. If Broken Sky was offered to be turned into either a TV series or movie (and only one of them! ), which one would you choose and why? Ooh, tough question. Can I choose the director? If I could have Joss Whedon, he could do whatever he wanted with it. Otherwise, I think I’d have to go for a TV series. So many of them are done brilliantly these days, and you have more room to explore the story and the characters. 5. Who would be your ideal cast? Thank you so much to L.A Weatherly for taking the time to do this interview, and HarperCollins Australia for setting it up! Welcome to a ‘perfect’ world. Where war is illegal, where harmony rules. And where your date of birth marks your destiny. But nothing is perfect. And in a world this broken, who can Amity trust? Set in a daring and distorted echo of 1940s America, the BROKEN trilogy is an exhilarating epic of deception, heartbreak and rebellion. The first in a brand-new YA trilogy with an exhilarating mix of irresistible romance, breath-taking action and thrilling mystery. Effortlessly fuses the old-style glamour of 1940s America with the corrupt menace of a futuristic world in a hugely original twist on the steampunk genre – Blitzpunk.